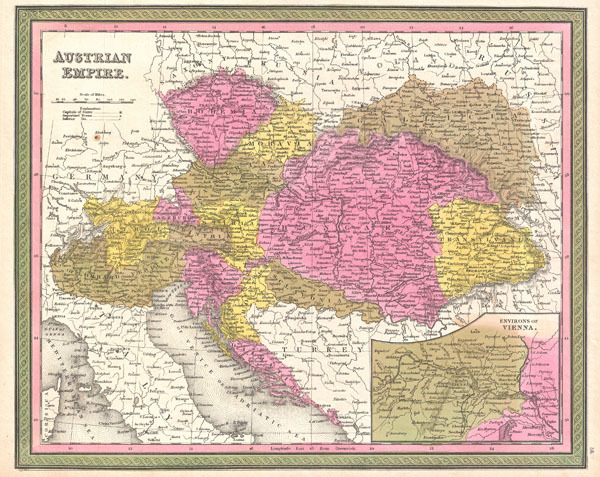 An extremely attractive example of S. A. Mitchell Sr.'s 1850 map of the Austrian Empire. Includes much of today's Austria, Hungary, Romania, Albania, Serbia and Croatia. Depicts the entire country color coded according to individual states. Lower right quadrant features an inset map of the Environs of Vienna. Surrounded by the green border common to Mitchell maps from the 1850s. Prepared by S. A. Mitchell for issued as plate no. 56 in the 1850 edition of his New Universal Atlas. Very good condition. Minor marginal toning. Else clean.